I use it on my mule and he likes it and it works great. This is a very good product and probably deserves a 5-star rating - but I have one horse that is super-tough on fly masks and fringe. I'd give it 5 stars if they made one in leather so it would last longer for my problem child. I have been looking for something like this for a while. I just hope it stays on. I like the idea as sometimes either flies get under a mask and or hay debris gets caught near the eyes. Horses with screened mask tend to tear and remove fly mask. My horses hate their fly masks, and keep getting them off, so I thought I would give these a try. 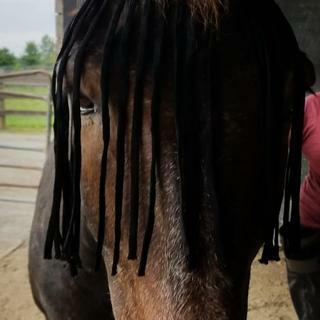 I figure I can put a rubber band in their forelock around the poll piece. Worth a try! This product looks perfect for one of my horses. I am looking for an alternative to fly masks. The horse I purchased these for does not keep a normal fly mask on at all. I will post a review after I have tried this product. I sure with the website gave better descriptions of the product and had actual photos instead of dumb "clipart"!!! Fly veils are great on super hot days when a heavy fly mask is just too much. They also offer great protection over a bridle. Does this mask close with Velcro ? BEST ANSWER: Yes,- it is very easy to put on.